Switerland, 1816. On a stormy summer night, Lord Byron and his guests are gathered round the fire. Felix, their serving boy, can't wait to hear their creepy tales. Yet real life is about to take a chilling turn - more chilling than any tale. Frantic pounding at the front door reveals a stranger, a girl covered in the most unusual scars. She claims to be looking for her sister, supposedly snatched from England by a woman called Mary Shelley. Someone else has followed her here too, she says. And the girl is terrified. This is my second Emma Carroll book this year, the first being Frost Hollow Hall. Much like the first one, this is also a children's book aimed at 9-11 year olds, but we will read books for any age group over here. If it's enjoyable as an adult, that is all that matters. When Lizzie arrives in Switzerland at the home of Lord Byron, she has a dark tale to tell. She is covered in mysterious scars all down one side of her body and looking to take her sister home, a sister she believes was kidnapped. As Lizzie's story unfolds, we learn about her life back in England, how the scars came about and her time at Eden Court, a magnificent house taken over by a scientist, that changed her life forever. She settles down to recount her tale to a servant boy, Felix and Mary Shelley and when she's finished, Mary can hardly believe what she's heard but she knows it's the truth and she knows that from Lizzie's story she is going to pen a novel - Frankenstein. I have nothing but praise for this book, I absolutely loved it. I loved the inclusion of real life literary greats even though Mary Shelley was the character that was expanded on the most out of her, Lord Byron and Percy Shelley. Lizzie's tale was well told, packed full of vivid descriptions and built up suspense really well. The take on the inspiration for Frankenstein was very clever and enjoyable. 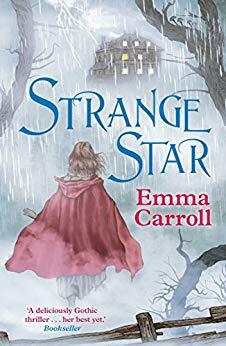 Overall, Emma Carroll had created a wonderful Gothic novel with Strange Star that I found difficult to put down. I thought Frost Hollow Hall was good but this far exceeded that to become one of my favourite books that I've read this year. Despite the target audience of 9-11, there is nothing in this novel that can't be enjoyed by adults and I highly recommend giving it a go!